It was indeed simillar to the A-9, being designed by the same designer, but was more refined having a retracting undercarriage, provision for water ballast, and a wing centre section taering in plan form. The VGC felt very priviledged, that through the help of our Hungarian member Gabor Fececs, it was able, for the first time, to shed light on the RF-7, and to share it with the western world. Indeed, but for the VGC, information on the RF-7 might never have come out and there was the feeling that together with our fantastic restoration achievements and Rallies, that once again the VGC had justified its existence. It has long been the impression that in Communist Russia, there was great uniformity concerning everything i.e. that all communists should have to fly the same aircraft. The book “Planyeri CCCW’ by A.P. Krasilshchikov gives very much the opposite impression. There were so many designs and all of them were never built in quantity. The RF-7 broke records for distance, goal flight (343 kms), gain of height (3,388 m), and out & return 94.8 kms but only five of them were ever built. It was very fast, having a wing loading of 27 to 37 kgs/sq.m without and with water ballast. Its max. L:D was 1:30.5. 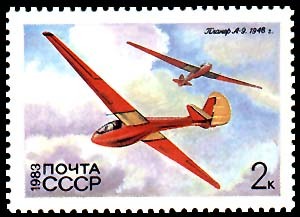 The aircraft was built of wood, which before 1941 was in general use for glider construction in the USSR. 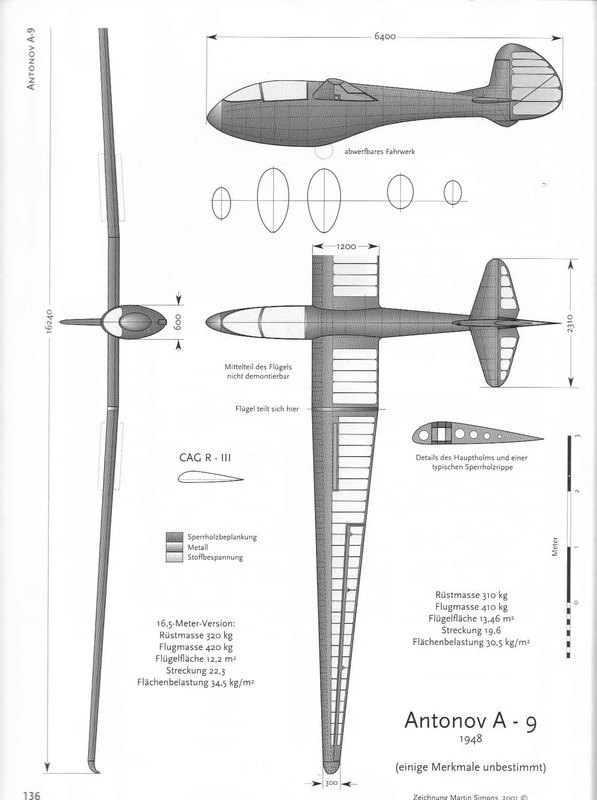 During the war starting in 1941, all sailplanes were destroyed in Russia except for a very few which were taken to Hungary. Although there were reports of an RF-7 being in Hungary, which was destroyed in an aerotowing accident over Budapest Airport in 1943, this is not true. 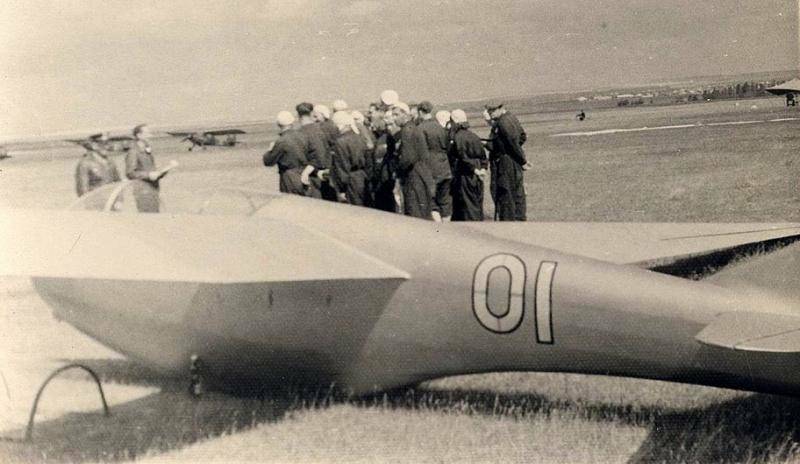 The sailplane was a GN-7, the great 650km world distance record sailplane flown by Victor Rastorgueff in 1937. In fact, Victor Rastorgueff managed three distance flights in one week in a GN-7 and all of them were further than the existing world distance record. 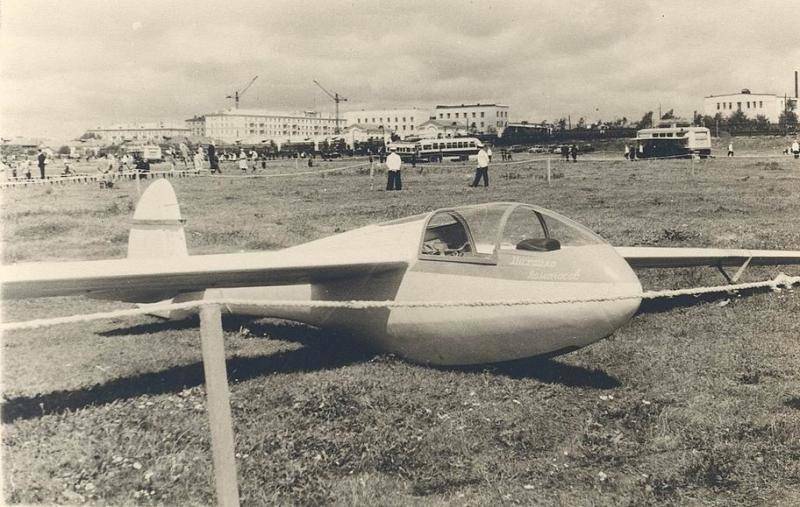 During the austere time after 1945, a new gliding movement was created in Russia with new sailplanes. 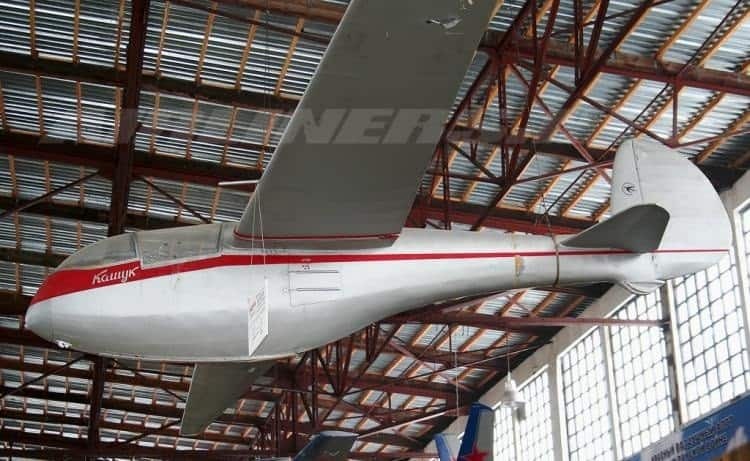 At first the proven wooden construction was used but by 1957, Antonov started designing sailplanes in metal which were similar in form to his wooden A-9. We have no constructional details of the RF-7, but we do have them for the A-9, which was similar to the RF-7 but simplified. Gone were the water ballast tanks and the retracting undercarriage. The wing centre section was of rectangular plan form replacing the RF-7’s tapered planform centre section. The A-9 had no landing skid. It had a rigid keel built into the fuselage. The pilot was spared the shocks on landing by a very well sprung seat. Furthermore, it was then common practice to retrieve sailplanes in the Soviet Union by putting them on lorries! With the RF-7 and A-9, all that was done to derig them was to remove their outer wing panels. The wing centre section and tailplane were built on to the fuselage and could not be removed. Thus the sailplane, with its wing tips removed, had to be lifted on to a lorry and roads in Russia were wider than its centre section! Whereas the RF-7 weighed 245 kgs empty without water ballast, the A-9 weighed 360kgs empty and this confronted would be lifters with a considerable athletic feat to lift it on to a lorry, even without its outer wing panels. There had been only five RF-7s built in 1938, 27 A-9s were built in 1948 and these were the standard high performance sailplanes used in contests and for record attempts in the Soviet Union, until the arrival of the 200 all metal A-Ils in 1957 and the later arrival en masse of the Blaniks from Czechoslovakia. However, back to the A-9, in which we see the ghost of the prewar RF-7. The A-9 had a massive main wing spar and the aircraft was so fast that it had become known in Poland at Leszno, where it had been flown by Soviet competition pilots, as “the destroye” (which presumably refered to the ship type, rather than it as a demolisher of other aircraft!) The 27 A-9s were built during the progress of five years in a factory at Novosybirsk and as with the RF-7, A-10 and A-11, the wing profile R-111 was used modified. The A-9 that C.Wills saw in 1958 at Leszno was finished in rough surfaced military camouflage paint i.e. brown upper surfaces and blue lower surfaces. The A-9 was designed to be flown in very good soaring conditions. Its max.L/D of 1:28 was less than that of the RF-7 but this did not prevent it from setting up a number of World Gliding records. 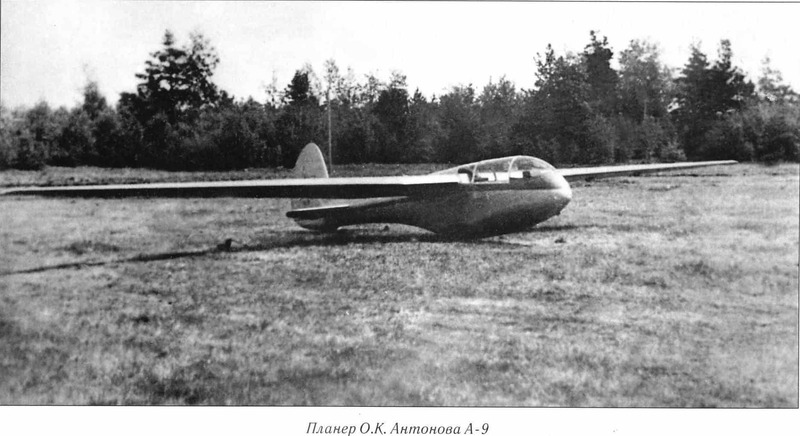 A modified A-9, the A-9 bis was designed by Oleg Antonov. Its wing was in two parts and was without a centre section. Furthermore, the wing was mechanized (ie.variable geometry, fowler flaps?). The A-9 bis started its test flying in 1955. 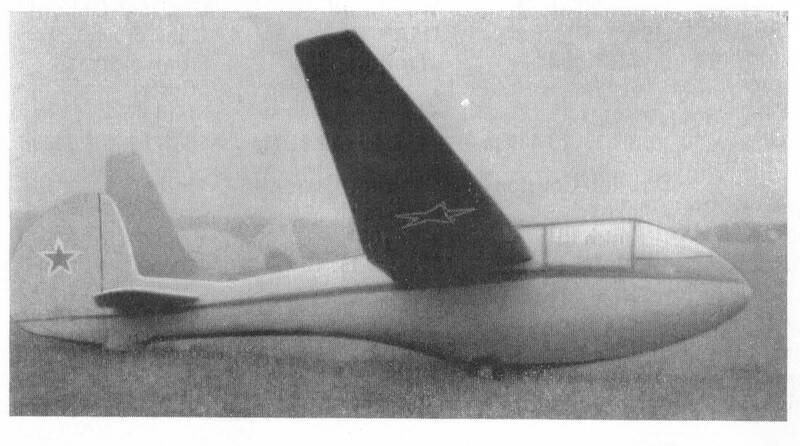 As if the A-9’s wing loading was not high enough, a two seater version of it, with pilot and passenger seated back to back, was designed in 1952 by O.K Antonov. This type, known as the A-10, set up records for two seater gliders, including one of 829.8 kins on the 26th of May 1953. 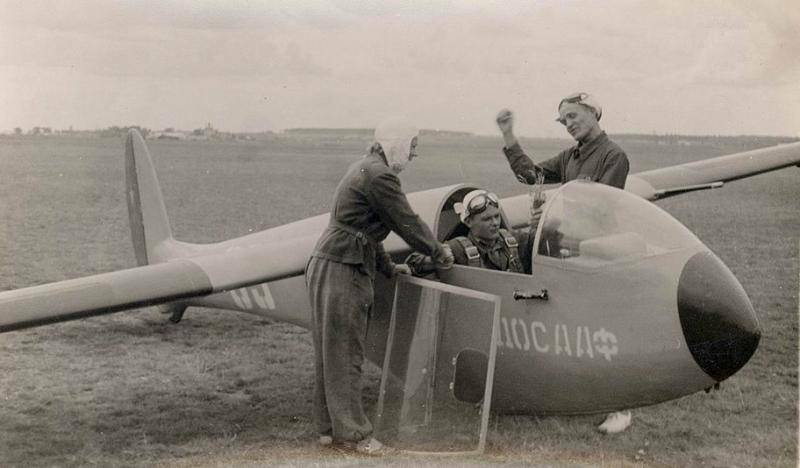 For this flight, from near Moscow to near Stalingrad, the pilot Master of Sport V. llchenko received the Lilienthal Prize. His passenger was G.M. Pechnikov. 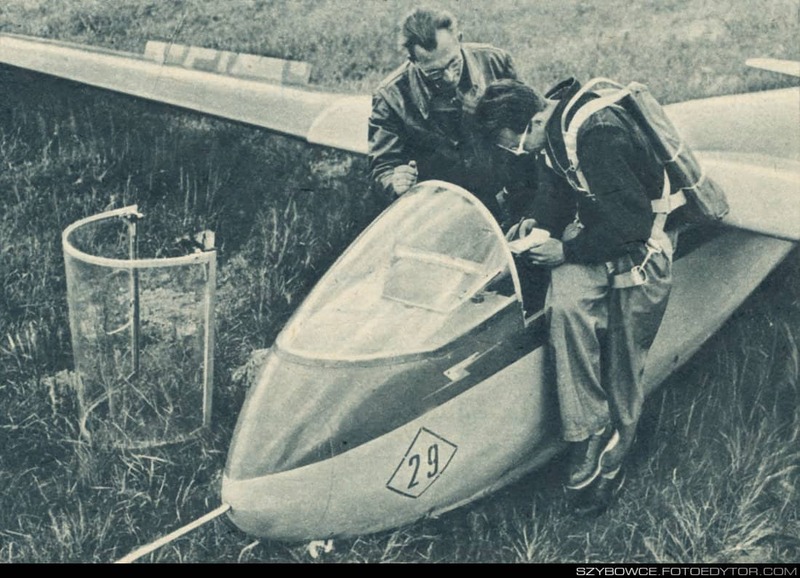 Ilchenko came to the 1954 World gliding Championships at Camphill to describe his flight to those taking part.